Tire warranty, safety ratings, speed ratings, performance trade-offs these aspects, among other things, are important to consider when in the market for new tires. When you're ready for your next set of tires, you'll also need to be ready to decide on the most important feature you expect from your tires: A smooth, quiet ride? Great grip on hot, dry roads as well as in the wet? Longer tread wear? 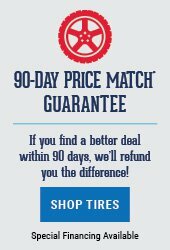 Many tires are covered by a limited warranty that typically lasts until you exceed a certain number of miles (mileage warranties) or until the tire's tread wears to 2/32 of an inch (tread life warranties). There's always more to learn at Pep Boys. Here's the word on more of the words and symbols written on your tires. You'll probably never need to get this technical but here's some addition info on how your tires are constructed and the job they're supposed to do. Tires are graded by tire manufacturers in controlled tests that meet the U.S. Department of Transportation (DOT) and National Highway Traffic Safety Administration (NHTSA) specific standards of performance including: tread wear, traction and temperature tolerance. These 'grades' are molded on the tire sidewall. You can also find the UTOG ratings printed on the delivery stickers attached to your new tires.